When you’re looking for the perfect retirement community, what’s most important to you? 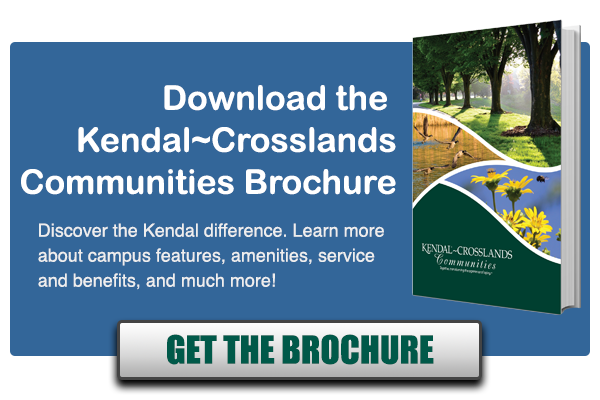 For many people, the lifestyle at Kendal-Crosslands Communities means they spend most of their time engaging in activities in the community, whether it’s meeting with a book or writing club, going to the fitness center, or volunteering. Some have referred to it as being like college without the grades, where residents spend time engaged doing what they love most, and exploring interests that keep them young! When Jane was looking for a new retirement community, she wanted to be close to her son who lived and worked near Wilmington, DE. She had already downsized in the past and knew she didn’t need a big place to “fill up with extra stuff” as she put it. Jane wanted a “me-sized, pied-a-terre” that gave her a comfortable place to be, but the community was just as important. Jane lived in Connecticut for years, and regularly went to New York City to take advantage of all the arts and culture. Finding a retirement community that would be both close to her son and could compete with everything being close to New York had to offer was going to be a challenge. At Crosslands, Jane found a comfortable, cozy cottage she could come home to after a concert or a visit to Longwood Gardens. Her one bedroom apartment offers her everything she needs, and the special, welcoming community she longed for. At Kendal-Crosslands Communities, she also found new friends who were as passionate as she is about the arts. With Longwood Gardens, Winterthur Estate and Museum, Brandywine River Museum, Pennsylvania Academy of the Fine Arts, Philadelphia Art Museum, the Rodin Museum, the Philadelphia Symphony and more at her doorstep, Jane has all the art and cultural opportunities she had living in Connecticut! “Plus, we’re still close to New York, so I can get there easily by train if I want,” Jane said. “I moved in in May (of 2018) and I felt like I had friends from the very start,” she said. She found a group of people who shared her interests and it felt like home in no time. She loves having Sunday Breakfast with her new Crosslands friends, and feels like it’s what she’s always been looking for. That’s the common experience here at Kendal-Crosslands Communities. In part, our Quaker-based values means everyone is valued for what they bring to the community, and their individuality is seen as a strength. If you’re looking for a community where you’ll feel right at home, look no further. 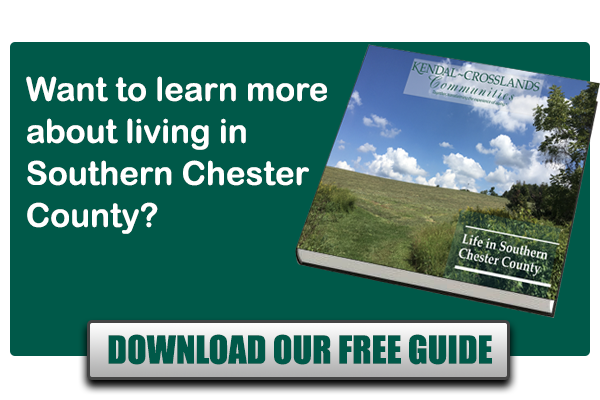 Just click below to download our brochure, and start your journey to a community where you can enjoy the natural beauty of our 500 acre campus, while still having easy access to the arts and culture of a big city, just a short drive away.